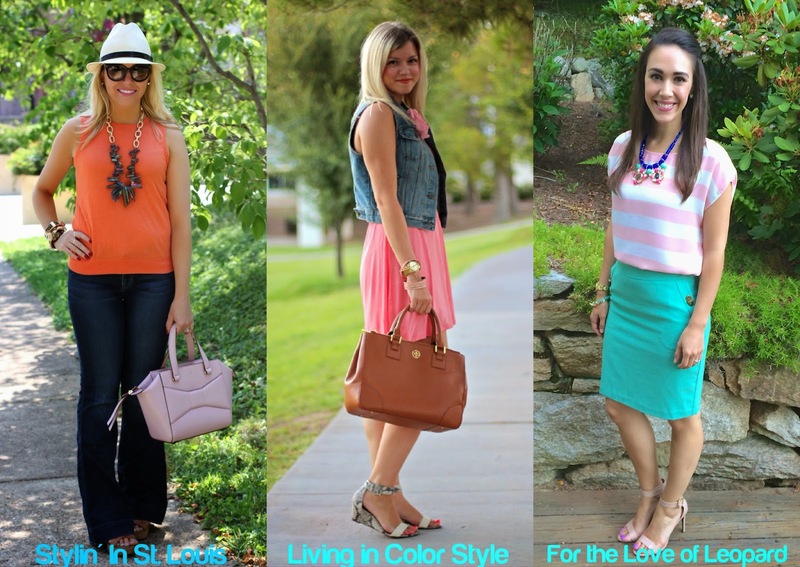 Stylin in St. Louis: Spotlight of the Week: Summer Pastels…. Spotlight of the Week: Summer Pastels…. Happy Thursday! This week Elle and I are styling summer pastels! I love soft colors in the summer! They always remind me of sherbet ice cream! Yum! Come link up your pastels with Elle and I! 1. We kindly ask that you follow the two hosts: Elle from Living in Color Style and Jacqueline from Stylin' In St. Louis via Bloglovin or GFC and of course our co-host Danielle of For the Love of Leopard. Spotlight: Our spotlight of the week is Ariel of Auteur Ariel blog! 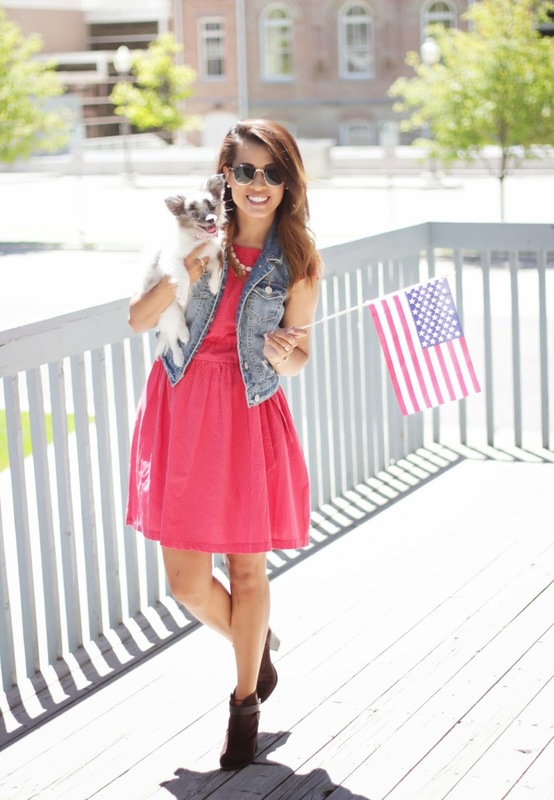 Ariel's perfect accessories pull this all-american look together perfectly. She certainly knows how to rock the red, white, and blue! Be sure to check out her cute blog! Next week: Next week our spotlight weekly theme is chambray. Thanks for linking up! See you next week! Love your look girl! And I doubt I even have to say it, but that bag is one of the best! Thanks Becky! It was a lucky sale find! Adorable outfit! The orange top is a great color on you and your arm candy is perfect! Loving the animal print bracelet! Flares are my favorite style jean! orange suits you well, love this look. I just love your arm candy! I would love each and every one of those bracelets! That orange top looks so pretty on you! Loving the leopard cuff and the arm candy too! Cute summer look!! Orange looks great on you! It's always a joy to be here & be with you gorgeous ladies! Love your latest ensemble but definitely can't ignore that statement necklace & Your arm candy!! Beautiful pics! Lovely color and amazing outfits! The jewelry in your look today is ACE, babe. Love, love! Your arm candy is FAB! Thanks for hosting you three! I love the pastel looks. All three of you look beautiful. I've been loving this necklace since I saw your post on instagram, and now I'm loving this whole outfit! So cute! Thank you! Such a fun necklace! Your necklace is incredible and I am loving that orange top on you! I love that necklace and your bracelets are great! so fab. love the color! Loving the outfit, but you were just killing it with the accessories. I love it! Pretty!! I'm soo in love with this look.. especially those flared trousers! I am so jealous that you can rock not only hats, but orange as well! Such a fab color on you! You look great rocking those wide-legged jeans. You always look adorable in a fedora and I love your hat. Your necklace and bracelets are all gorgeous. I love the coral top with that fun shimmer necklace. It's a cool color combo that I don't see very often. Thanks for hosting the link up!